I hate crowds. I hate fighting and jostling with the crowd for foods. It makes me feel like I am a refugee in a war torn country grabbing food rations. And if I have to pay for that, it makes me even more turned off. 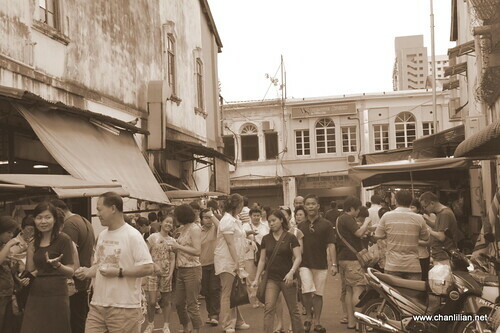 During Christmas, there were this huge group of people at the Penang Road famous Teochew cendol stalls. There are two stalls. 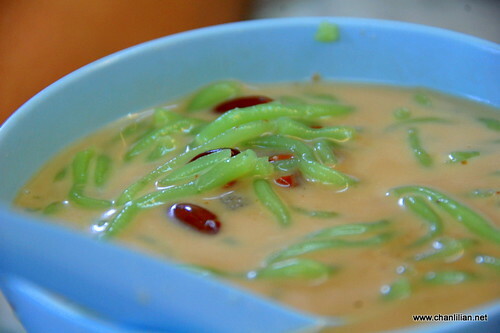 One is call the Teochew cendol, the other the Raja Uda cendol. To me, they taste both the same. But probably, the Teochew one is clever to rub shoulders so he has better business. See? The taukey sat with the famous people and the photos are all over the wall in this little coffeeshop. You just need to walk a bit further down, look for the green and white quaint coffeeshop belonging to the Teochew Cendol. They don’t sell any foods, only rojaks. But I teach you a trick. Just go straight to the Teochew Cendol coffeeshop, sit down and ask the Indonesian worker to bring you what you want. No need to scream and shout, jostle and shove with tourists. It was a breeze! The rojak is not bad in my opinion. I hate eating rojak and I think in a year, I ate like once or twice only. So, if I say it is good, it is good, ok? 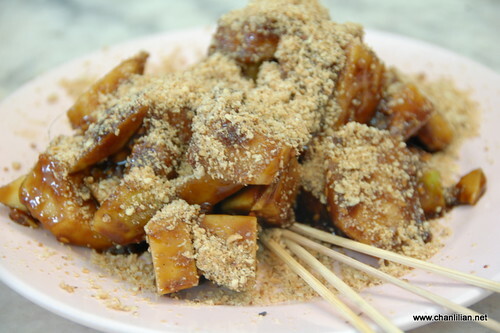 🙂 Penang rojak has cucumber, turnip (sengkuang), green mango, pineapple and tau pok slathered with their stinky rojak sauce and covered with grounded peanuts. I saw someone having the ais kacang and it looks pretty. Eventhough no one wants a bowl, I ordered it nevertheless because I know it makes a good photo. 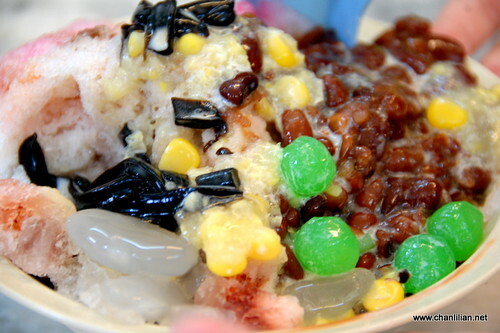 So, here is a bowl of ais kacang loaded with a lot of red beans, sweet corn, attap chee, leong fun and sago balls. And what makes people throng to this cendol stall? The gula melaka syrup with coconut milk plus the fragrant green thread are simply the best. Unlike some cendol, this stall cendol does not hardened. You may want to try their daun pegaga juice too. I don’t like the taste but I heard daun pegaga gives women beautiful complexion. You should be able to find this cendol stall if you are in Penang Road. The stalls are located at a tiny lane call Leboh Keng Kwee but we call it Penang Road Cendol. chinnee – Aiyah, so kesian to hear that. They now have a nice branch just outside of Komtar. Next time just wound down the window and ask the people. We Penangite very friendly one, can show you the way 🙂 .